Qatar, officially the State of Qatar, is a sovereign Arab emirate, located in Western Asia, occupying the small Qatar Peninsula on the northeasterly coast of the much larger Arabian Peninsula. Its sole land border is with Saudi Arabia to the south, with the rest of its territory surrounded by the Persian Gulf. A strait in the Persian Gulf separates Qatar from the nearby island kingdom of Bahrain. The capital city is Doha, and the country has a population of 2,144,000. Qatar is an absolute monarchy that has been ruled by the Al Thani family since the mid-19th century. It was a British protectorate from 1916 until it gained independence in 1971. Most Qataris belong to the strict Wahhabi sect of Islam. Qatar has the most conservative society in the Persian Gulf after Saudi Arabia. Qatar has the world's third largest natural gas reserves and oil reserves in excess of 25 billion barrels, which has fueled Qatar to become the world's richest country per capita and achieve the highest human development in the Arab World and 36th highest globally. Proposed Arabian Gulf Currency Designs of the 1960s. "The project for a common Gulf currency looks like being shelved for the time being, and instead Qatar and Dubai are aiming to issue a joint currency in the near future." Qatar then introduced the Qatar and Dubai riyal, which was the result of signing the Qatar-Dubai Currency Agreement on 21 March 1966. Coins were introduced in the name of Qatar and Dubai for 1, 5, 10, 25 and 50 dirham. The Saudi riyal was worth 1.065 rupees, whilst the Qatar and Dubai riyal was equal to the rupee prior to its devaluation. The common reverse of the Qatar and Dubai coinage depicted an Arab dune gazelle. It was designed by British artist Christopher Ironside for the Royal Mint. The animal has various common names, but its scientific name is Gazella leptoceros. The obverse of the coins showed the country's name in English and the denomination in Arabic. The same simple pattern appeared at the upper half of the inner rim of the coins. The 1, 5 and 10 dirham coins were made of bronze, whilst the 25 and 50 dirham coins were made of copper-nickel. Despite the fact that Qatar and the Sheikhdom of Dubai were merged under a monetary union, the two territories were governed independently of each other. Left: Qatar and Dubai, 1 rial. Right: Muscat, 5 baisa. 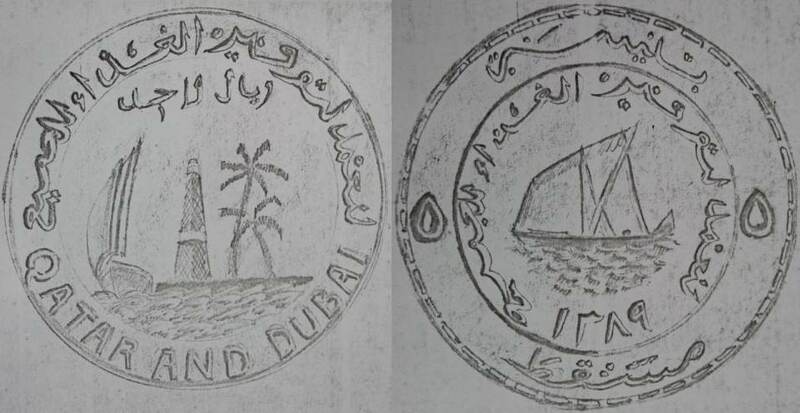 Above is a sketch for a FAO-themed coin for Qatar and Dubai (artist unknown), dated AH 1369, which translates to AD 1969. I found the sketch in some old Royal Mint records in the National Archives, London. 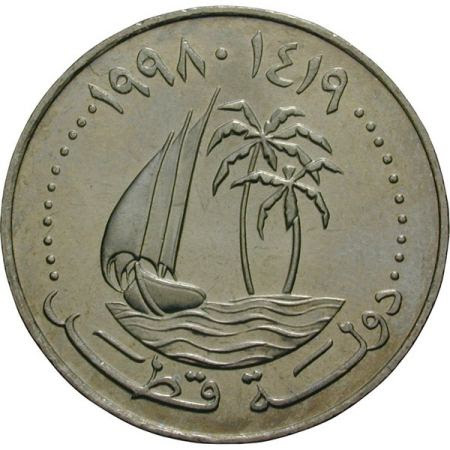 The boat on the reverse of the sketch in the previous post resembles the dhow on this Muscat and Oman 5 baisa coin of 1961. 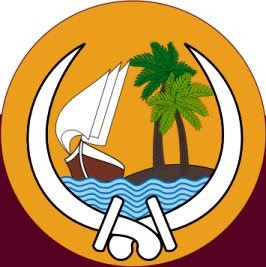 Qatar became independent in September 1971, while Dubai did so in December 1971. Dubai then joined the United Arab Emirates. Qatar had been invited to join, but it declined to do so, preferring to remain separate and independent. In 1973 Qatar introduced a new series of coins in the same sizes and compositions as those of the Qatar and Dubai coinage, but in the name of Qatar only. The design on the common reverse (above), by British artist Norman Sillman, was based on the national emblem. The obverse designs of the coins were quite plain and somewhat similar to those of the Qatar and Dubai coinage. From the year 2000, the denomination was added in English to the 25 and 50 dirham coins only, and the dot separating the CE and AH years was replaced with a minus sign. In 2006 a new emblem was placed on the common reverse of all the coins. Also from 2006 onwards, the changes that had been applied to the obverse of the 25 and 50 dirham coins in the year 2000 were now extended to the rest of the coinage. (MENAFN - Gulf Times) Qatar Central Bank (QCB) has released "2016 version" of coins of five denominations Dh1, Dh5, Dh10, Dh25 and Dh50. These will be in "circulation side by side" with the current coins. QCB said, "These coins will have the same specifications as the currently used coins with minor amendments." The amendments include English letters for numbers on the top of the coin, a change in font for the coin value and a change in the English font (State of Qatar) on the back of the coin. On the face of the coin, the year of production has been mentioned on top and there is a change in the Arabic font (State of Qatar). The change of English font to classical Gothic is quite surprising. Have not seen it on any of the recent coins. The Qatar and Dubai coinage set of 1996.